Tettigoniidae is a major family of "long-horned grasshoppers" in the suborder Ensifera of the order Orthoptera, characterized by strong hind limbs for leaping, powerful mouth-parts for chewing, four tarsal segments, long and threadlike antennae (which have well over 30 segments and may exceed their own body length), stidulatory specializations of the forewings to make sounds, and a left over right overlap of the singing wings in males. 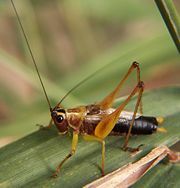 Members of Tettigoniidae are known by the common name of katydids in the New World, Australia, and New Zealand, and bushcrickets in Europe, while the term long-horned grasshoppers also is used in some locations (sometimes in Australia and New Zealand as well), but sometimes also applies to members of Ensifera in general. 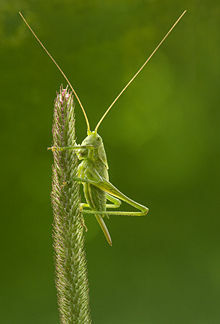 Tettigoniids are closely related to the crickets of the same Ensifera suborder. Tettigoniids are a very large group, with more than 7,000 species in over 1000 genera, and can be quite large (1 to 6 centimeters). They are found on all continents except Antarctica. Some tettigoniids are also considered pests by commercial crop growers and are sprayed to limit populations. However, significant crop damage generally is rare because of low population densities. Nonetheless, some species are significant pests, and some katydids can form large swarms, such as the wingless (and, thus, flightless) North American Mormon cricket (Anabrus siimplex) and the African conehead katydids (Ruspolia spp.). The Mormon cricket is actually a tettigoniid, not a cricket, and can grow to almost three inches in length and is capable of traveling up to two kilometers a day in its swarming phase, during which it is a serious agricultural pest and traffic hazard. However, tettigoniids also provide important functions for the ecosystem and for humans. Ecologically, they are very important in terrestrial food chains, being preyed upon by invertebrates and vertebrates, including mantids, amphibians, and birds. They also add considerably to the ambiance of nature with their nocturnal "singing." In China, katydids have commercial value, being sold as singing pets. As member of the insect order Orthoptera (grasshoppers, crickets, katydids, and locusts), tettigoniids are characterized by chewing/biting mouthparts, incomplete metamorphosis (hemimetabolism), and two pairs of wings that are held overlapping the abdomen at rest. As with the other orthopterans, the forewings are narrower than the hindwings and hardened at the base, while the hindwings are membranous and folded fan-like under the forewings when at rest. As members of the suborder Ensifera, which also includes crickets, the tettigoniids are characterized by fine and threadlike antennae with well over 30 segments (except fossil representatives), stidulatory (the act of producing sound by rubbing together certain body parts) specializations of the forewings to make sounds, auditory organs (when present) linked via modified tracheae to the enlarged mesothoracic spiracles, a sword-like or needle-like six-valved ovipositor (when present), and elongate mandibles with a prominent incisor (Gwynne and Desutter 1996). Members of the family Tettigoniidae are united in having tegmina (modified leathery front wings used in singing not flight) that can be held away from the body as "roof-like" structures, a left over right overlap of the male singing wings, four tarsal segments, a vestigial stridulatory file on the right wing, and a fully functional stridulatory file on the underside of the left wing (Gwynne and Morris 2002). Tettigoniids are distinguished from the grasshoppers (or short-horned grasshoppers) of the suborder Caelifera by the length of their antennae, which is always relatively short in members of Caelifera. Tettigoniid antennae can reach to several times the body length. The name "katydid" comes from the sound produced by species of the North American genus Pterophylla (literally "winged leaf"). The males of katydids have sound-producing organs (via stridulation—) located on the hind angles of their front wings. Some species of Pterophylla produce a sound thought to resemble the words "Katy did, Katy didn't," hence the name. In some species of katydids, females are also capable of stridulation. Tettigoniids are found in a wide assortment of habitats and on all continents except Antarctica. Their habitats range from tropical forests to high altitude zones in mountains above the treeline. 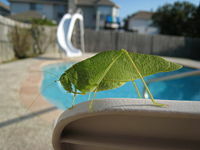 These habitats typically are tied to vegetation, with katydids retreating into or onto leaves, unlike most other ensiferas that use burrows in soil or holes in wood. The wings of katydids may resemble leaves or sticks, providing camouflage (Gwynne and Morris 2002). The spike headed katydid is somewhat notorious for its plantlike appearance, which allows it to blend in with the vegetation on which it lives, and the spikes discourage potential predators. There are about 255 species in North America, but the majority of species live in the tropical regions of the world. 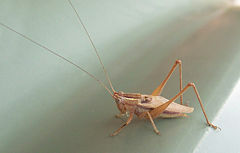 Unlike the short-horned grasshoppers of the Caelifera suborder, in which diurnal mating and feeding activity is prevalent, the katydids and crickets generally are nocturnal, although some are active during the day. Katydids tend to be omnivorous, consuming leaves, flowers, bark, seeds, carrion, and at times prey. Some species, such as the Saginae, are exclusively predatory, feeding on other insects, snails, or even small vertebrates such as snakes and lizards. Some katydids specialize on pollen, such as the Zaprochilinae (Gwynne and Morris 2002). Predators include bats, spiders, mantids, birds, frogs, snakes, and many other invertebrates and vertebrates. A main defense is camouflage as they disguise themselves among the vegetation. Large katydids can inflict a painful bite or pinch on humans if handled but seldom break the skin. In virtually all katydids, the mating sequence begins with singing by the males. This involves raising of the wings and rubbing of a dorsal scrapper on the right tegmen across a file on the underside of the left tegmen (modified leathery front wing). Most females respond with silent phonotaxis (approaching the sound source) but some respond acoustically (Gwynne and Morris 2002). During copulation, the males provide a nuptial gift for the females in the form of a spermatophylax as part of the spermatophore, a nutritious body produced with the males' ejaculate. The eggs are laid in plant tissue or soil. The most common life cycle is the egg as an overwintering stage and a single generation per year, with a single period of cold required, but some species require up to five winters before the eggs hatch. Other species may have more than one generation per year. There typically are four to nine instars before reaching adulthood (Gwynne and Morris 2002). Juvenile male Caedicia simplex. Auckland , New Zealand. Also found in Australia. Gwynne, D. T. and G. K. Morris. 2002. Tettigoniidae. Katydids, Long-horned grasshoppers and bushcrickets. Tree of Life Web Project Version 26 November 2002. Retrieved November 10, 2008. This page was last modified on 20 November 2015, at 15:26.